Some connections are instantaneous while others can take years to come together. When it comes to love, there is no simple formula. When it comes to director, Lone Scherfig’s ONE DAY though, it’s all about formula and fortunately, it is mostly a winning one. Scherfig follows up the brilliantly understated, AN EDUCATION, with an adaptation of David Nicholls’ best-seller of the same name, which checks in with Emma and Dexter (Anne Hathaway and Jim Sturgess) on the 15th of July every year for twenty years. Neither love nor life come easily to this pair and watching them grow in glimpses over the years reminds us how quickly everything can slip away if we aren’t careful. Scherfig’s gentle hand allows this high concept picture to transcend gimmick, and Hathaway’s shoddy British accent, to reveal genuine emotion and inspire some pretty real sentiment as well. By dropping in on this couple but one day a year, Scherfig could have had something terribly predictable and monotonous on her hands. Fortunately though, the much loved novel’s author is also behind the screenplay. As a result, Scherfig has the right material in front of her to balance the mundane and the monumental that is inherent in this premise. Some days go by without anything really happening at all but that’s life. There are some days even when Emma and Dexter don’t even spend July 15th together, as their lives have taken them on very different paths. The very first 15th of July we spend with them is the night of their college graduation. They barely know each other and end up in bed together but nothing happens other than of course the beginning of something beautiful. As the years go by, they each go up and down in mood and success at different times from each other, and both Hathaway and Sturgess are given the chance to grow in front of us. These young talents take on the challenge of spanning two decades and each matures as an actor in the process. By the time the end of the second decade approaches, their understanding of themselves and each other is both impressive and admirable. 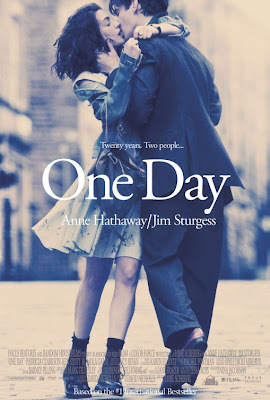 The title, ONE DAY, alludes to the structure of the plot but thanks to the yearning for closeness and longing for happiness that Scherfig weaves into this picture, it touches on something far more insightful as well. As each day and each year passes without settling or success, Emma and Dexter strive toward that time in their lives when they will feel complete, whole. They work toward that one day when everything will inevitably fall into place. And while that day may not exist for all or at all, for that matter, ONE DAY will have you believing that it is still coming. 2 our of 5 bagels! First of all, that’s hilarious. Secondly, I liked it somewhat more than that. I was a big fan of An Education. This is far beneath that work but I could see some definite strength in the direction.